An historian embarks on her artistic career. 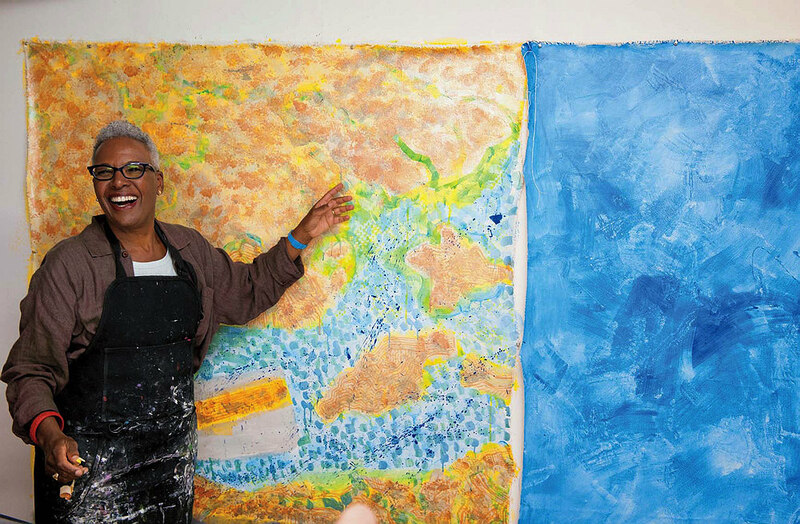 In 2006, Nell Irvin Painter, recognized by seemingly every venerable institution— Harvard doctorate, Princeton professor emerita, Guggenheim fellowship, to name just a few—boxed up her accolades as a historian and went back to school to become an artist. Now, 76 years old and 12 years deep into her second lifetime, her decision has been well documented and much discussed, not least by Painter herself, for whom a whirlwind press tour has followed the publication of her bracingly honest memoir, Old in Art School, this spring. But in her studio in a red-brick, nineteenth-century former toy factory in Newark, New Jersey, Painter, Ph.D. ’74, turns unforthcoming. Asked why she might bring together this drawn figure with that digital backdrop, such-and-such block of text with so-and-so loud field of color, she answers simply: Because she can. Because she likes the way it looks. Because to do so brings her pleasure. Yet pleasure is not enough: Painter insistently separates herself from the ranks of Sunday watercolor painters. More than a fish-out-of-water tale, Painter’s memoir testifies to her unusual ambition. Painter made Black Sea Composite Map 4 Historic Map (top) and Black Sea Composite Map 7 Washed Away in 2012, as part of her Odalisque Atlas project. The gatekeepers at the Rhode Island School of Design were not encouraging. Their reactions to Painter’s work, and even her presence, ranged from passive disinterest to racist, sexist, or ageist dismissal. Painter herself was dismayed to find her painting hand—dormant since college—rusty, her “twentieth-century eyes” unsophisticated. She set herself to tireless, iterative image-making, but even that drew criticism. Calling her “dogged,” one RISD teacher told her she’d “never be an artist,” no matter how much work she made or how many professional marks she hit. True, pure toil didn’t get Painter much closer to her first dream, of artistry through technical perfection. But the boot-camp-style cycle of effort and dejection (a “circuit of torture,” she writes) did help her find a niche: a convergence of art and history. With her thesis project, “Art History According to Nell Painter,” she collaged images of figures from black cultural history with paint-daubed fields of bold color and abstract patterns, distorting them with digital photo-manipulation tools, and obscuring or illuminating them with text. The project has echoes of Jacob Lawrence, Romare Bearden, and Faith Ringgold, but dodges nostalgia by being, simply, weird. “I’ve been skirting expectation for some time already,” Painter says. That began, arguably, with The History of White People, published in 2011, when Painter was in the midst of her M.F.A. Though the book sold in a way most academic historians only dream of, some critics called it “grandiose,” “superficial,” and “too ambitious.” To Painter, these criticisms were attempts to keep her within bounds: let the black historian write black history. Her ambition was a “problem” for the art world as well—her desire to work the material of her scholarship into images was deemed excessively academic or literal. Nevertheless, since graduating, Painter has steadily cleared the bars of professional achievement—gathering a handful of gallery shows, fellowships, residencies, and commissions. More importantly, she has staked out her own territory on the border between art and history, transmuting the figures and events that populated her old life with the tools of her new one. A project called The Odalisque Atlas builds on material from The History of White People: one imagined map transforms the geographies and stories of young women’s enslavement, drawn from across the globe and throughout time, into a single dense composite; labels and arrows swirl around the Black Sea. Also recently, excerpts from Harriet Jacobs’s Incidents in the Life of a Slave Girl have been transformed into imagery though digital projection and hand-painted lettering. A playwright friend commissioned images of Ella Fitzgerald and Hilton Als to illustrate an edition of her work; stage flats commissioned by an opera company feature Booker T. Washington and W.E.B. Du Bois. Everywhere in her work, towering figures of the historical black pantheon make glancing eye contact with the viewer, before slipping out of sight.